2015 got off to an exhilarating start for hundreds of Young Farmers across England and Wales on the annual YFC Ski trip. 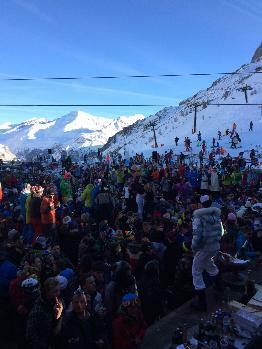 With thanks to tour operators, Outgoing, over 450 members travelled to Tignes in the Northern Alps to enjoy one of the most significant events in the Young Farmers calendar. 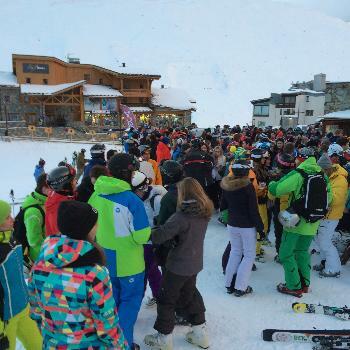 As well as some of Europe's best slopes, members also enjoyed a wide variety of activities, including camping in the wilderness, Apres ski and an evening with DJ Wire. There was even a guest appearance from Supermoo! The fancy dress theme for this year's trip was 'Retro', and once again, our Young Farmers failed to disappoint, sporting a wide variety of amazing outfits. Georgina Saxon, of Selby YFC, attended the trip as Yorkshire's ski rep. She said: "I had a fantastic time. I have skied before on previous YFC Ski trips and always had an amazing time. It is great to go with such a large group of people who are all just as crazy. After braving the very long bus journey it was definitely worth it and Selby YFC couldn't wait to get out on the slopes! "One of the highlights was one of our members getting us all a 'surprise'...which turned out to be snails... that was a very entertaining evening for sure! Finally, we all made it back in one piece with lots of great memories and plenty of tired muscles! Definitely a holiday to remember!" Caroline Baker, of County Durham FYFC, said: "12 members from County Durham FYFC travelled to Tignes. We were very noticeable wearing matching retro tie dye hoodies! Very easily identifiable on the slopes and in the bars! We all stayed in Dragon Lodge, Tignes and enjoyed yummy food and chilled out parties before joining up with the remaining 450 young farmers!!" The Ski Trip is just one adventure that NFYFC members can enjoy in the Federation's YFC travel programme. For any Under 18 members, there is still an opportunity to apply for this year's Tall Ships Adventure. Click on the link for further details. 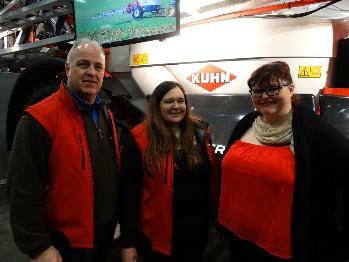 Kuhn Farm Machinery is championing the future of young farmers with a sponsorship deal with the NFYFC. 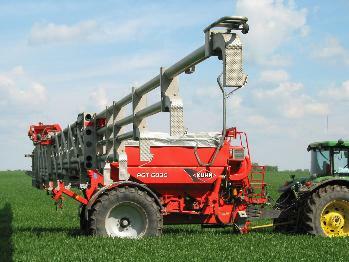 The agricultural machinery provider has pledged its support by sponsoring the NFYFC's AGRI Steering Group. It is also giving its support at next year's Annual Convention by sponsoring the AGRI Forum and the Convention wristbands. Kuhn, the world’s leading supplier of specialised agricultural machinery, will enable NFYFC's members to have their voices heard by policy makers and people within the agricultural industry with its support of the AGRI steering group. The group is made up of regional YFC members who are passionate about rural life and agriculture. The group meets up three times a year to discuss the role that Young Farmers play in the world of British farming. One of the steering group's key decisions is to choose the theme and organise the AGRI Forum in April. Held at the NFYFC Annual Convention, the forum provides a unique platform for Young Farmers to discuss topical agricultural issues and initiate debate with industry leaders. It is open to all YFC members, supporters and guests and encourages attendees to have their voices heard about key subjects for future farming. The Annual Convention is the most popular event in the NFYFC calendar, with over 5,500 members attending every year. The theme for 2015's AGRI Forum in Torquay is "What is your future in farming?" Sian Pritchard, managing director at Kuhn Farm Machinery, said: "As an organisation, we care deeply about the future of agriculture in this country and the legacy that we leave to the next generation of Young Farmers. We fully support what the NFYFC do and are keen to promote the great work that Young Farmers are doing across England and Wales. This sponsorship with NFYFC enables us to understand the challenges that face young farmers today. We have only been supporting NFYFC since October, but we hope that this is the start of an exciting partnership." As well as Kuhn’s generous sponsorship, Young Farmers will have the opportunity to take a tour of Kuhn’s European headquarters as part of NFYFC’s study tour to France in February. For further information on the tour, please visit www.nfyfc.org.uk/francestudytour.